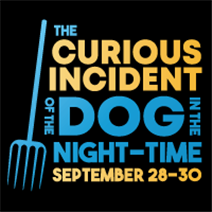 A pre-show discussion will be held from 6-7:00 pm prior to the performance on Saturday, September 29. Local psychiatrist Dr. Christopher Okiishi will be joined on stage by mental health professionals, parents, and cast members in an interactive discussion about the themes of the play--how people on the Spectrum encounter the world and what families do to help and encourage their loved ones, as well as a discussion on navigating our own community vs. the community presented in the play. The discussion is free and open to the public.